Minimal upgrade. 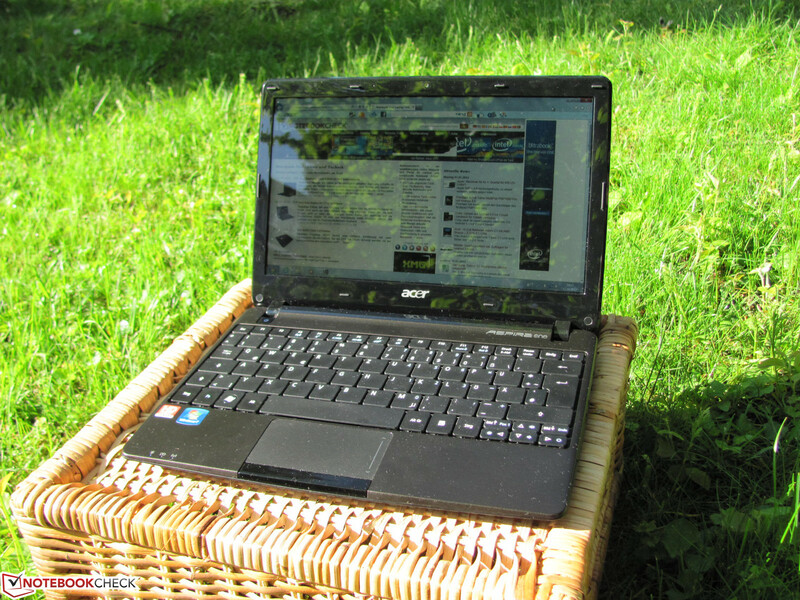 Acer has updated the Aspire One 722 to offer more performance. In this review, we will determine whether Acer has achieved its goal with the inclusion of the AMD C-60 CPU and Radeon HD 6290 GPU and will also examine what other improvements Acer has made. 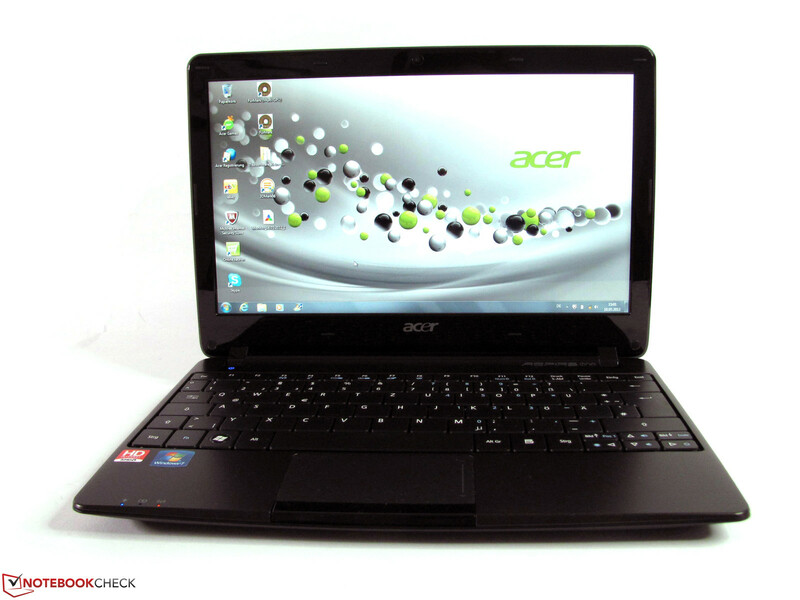 The Acer Aspire One 722 is an 11.6-inch netbook and is an incremental improvement over the original subnotebook class. 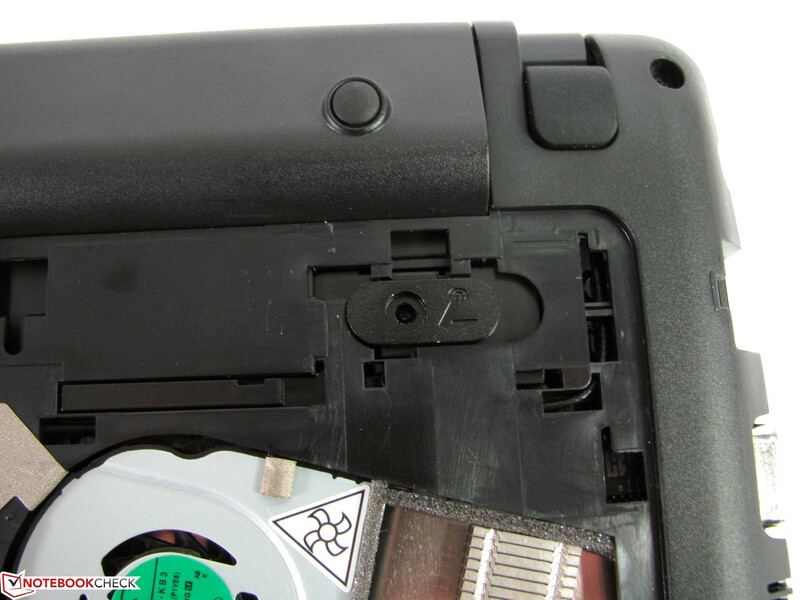 The most obvious differences between the Aspire One 722 and other subnotebooks are the reduced features and noticeably less powerful components of the One 722. 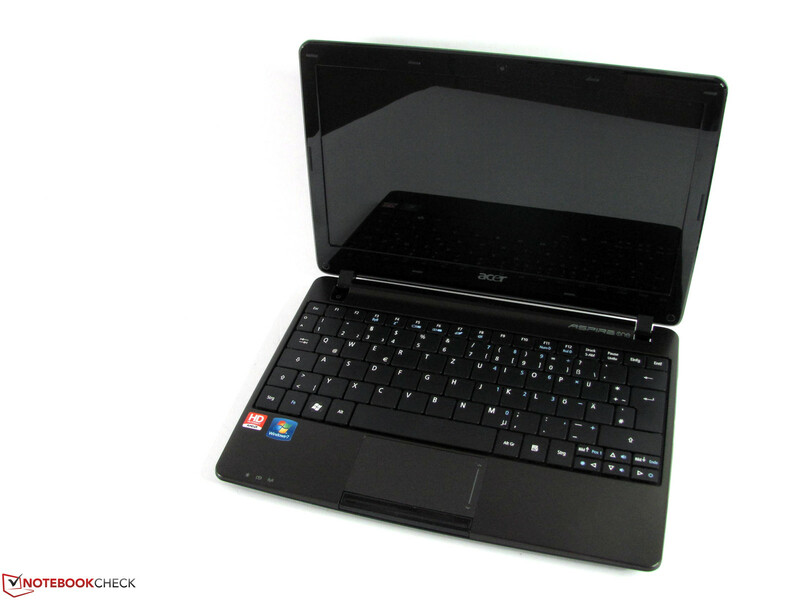 Our test sample is the Acer Aspire 722-C62kk. 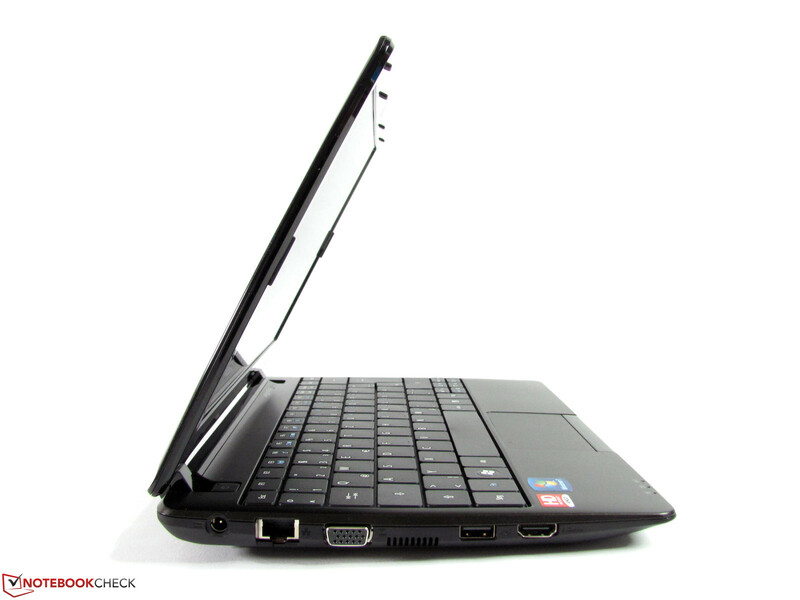 With a retail price of about 350 Euro ($429 USD), the netbook features the AMD C-60 CPU, ATI Radeon HD 6290 graphics card, 2 GB RAM, a 320 GB hard disk, and a relatively large 48 Wh battery. Windows 7 Home Premium 64-bit serves as the operating system. 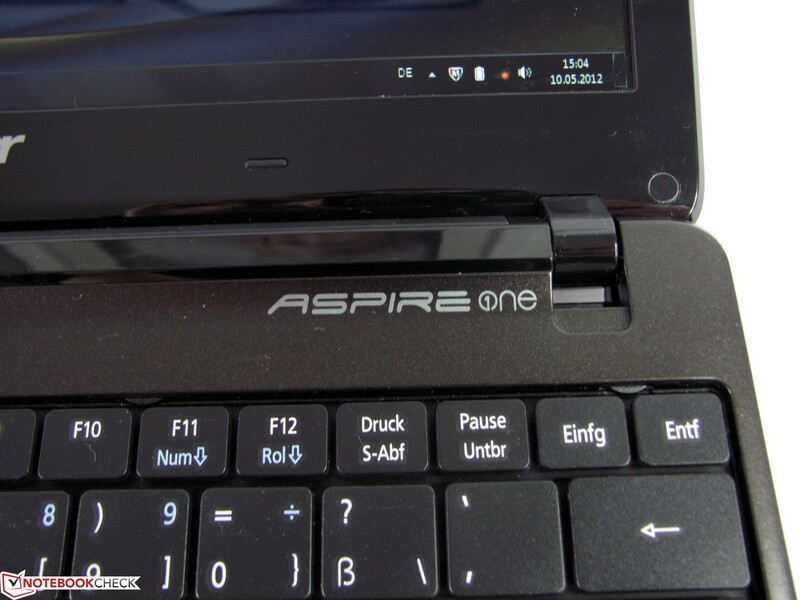 As part of the Aspire One 722 model line, our test model uses the same case as the already-reviewed Aspire One 722-C52kk and has the same strengths and weaknesses. The display lid is visually attractive with its ripple pattern but can quickly become annoying in practical use because of the visibility of fingerprints, scratches, and dust on the glossy surface. The material surrounding the keyboard is better and less flashy. The display frame and base unit are both stable and not easily flexed. On the other hand, the keyboard area is less resistant to selective pressure, especially the keypad and wrist rest area to the left of the touchpad. Both bend under even light pressure. 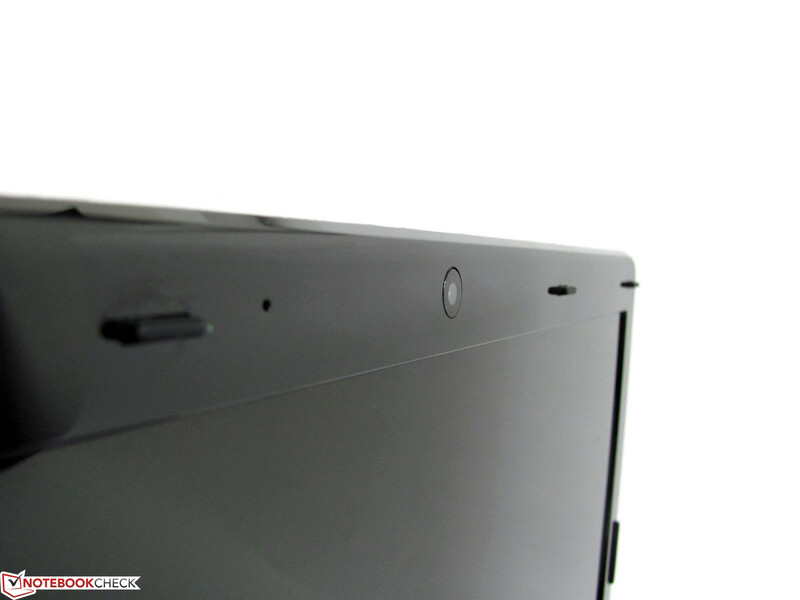 The display hinges are tight and allow a very large opening angle without any wobbling. 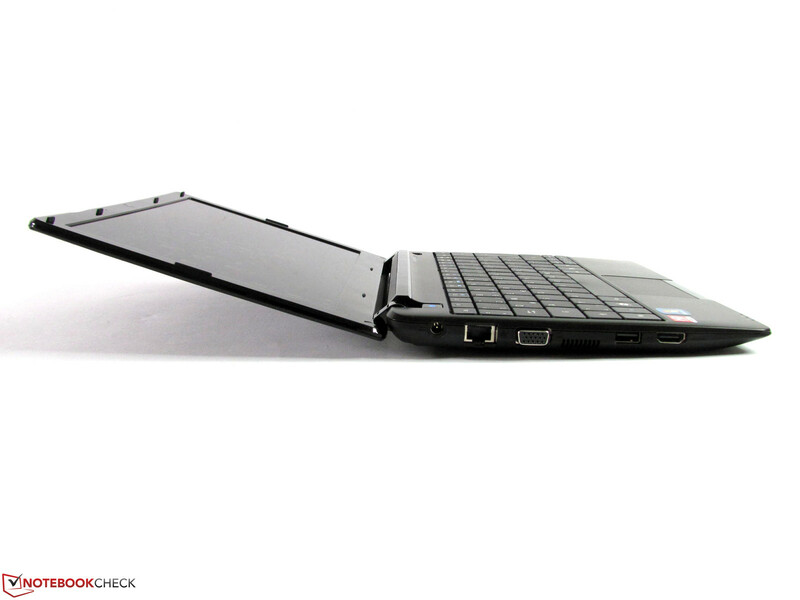 As with the case, the interfaces are the same as in the Aspire One 722-C52kk. The three USB ports and the SDHC card reader managed transfer speeds of 27.1 MB/s and 14.2 MB/s respectively. 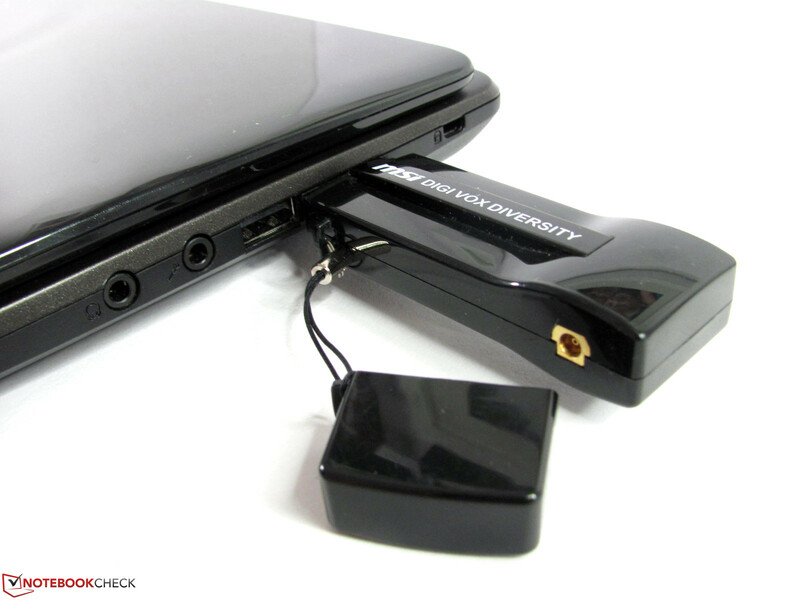 External display connectivity is available via the VGA and HDMI ports. Both are capable of good picture qualities at a maximum resolution of 1680x1050, although the HDMI delivers a slightly sharper picture. There are both pros and cons to the arrangement of the interface. 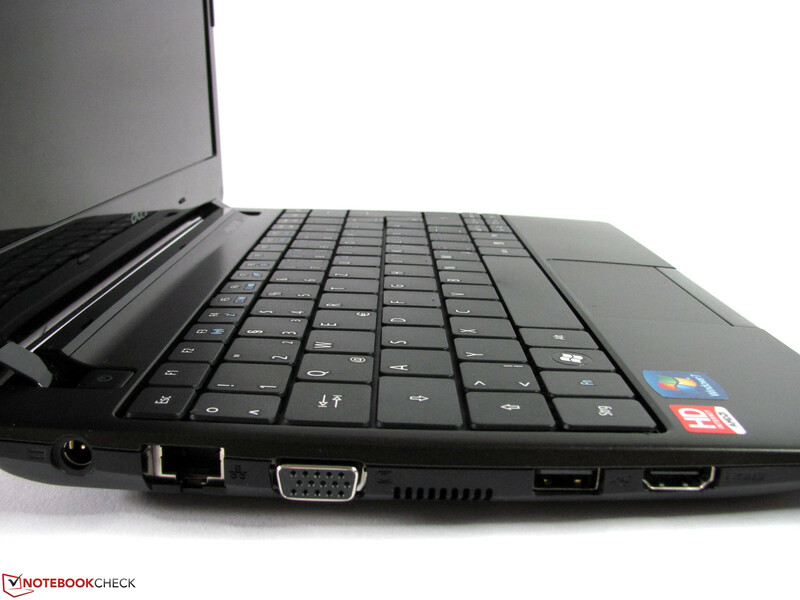 The USB ports on the right side are located toward the back and allow for easier cable management, but the space between them is narrow and larger USB connectors cannot be used simultaneously. 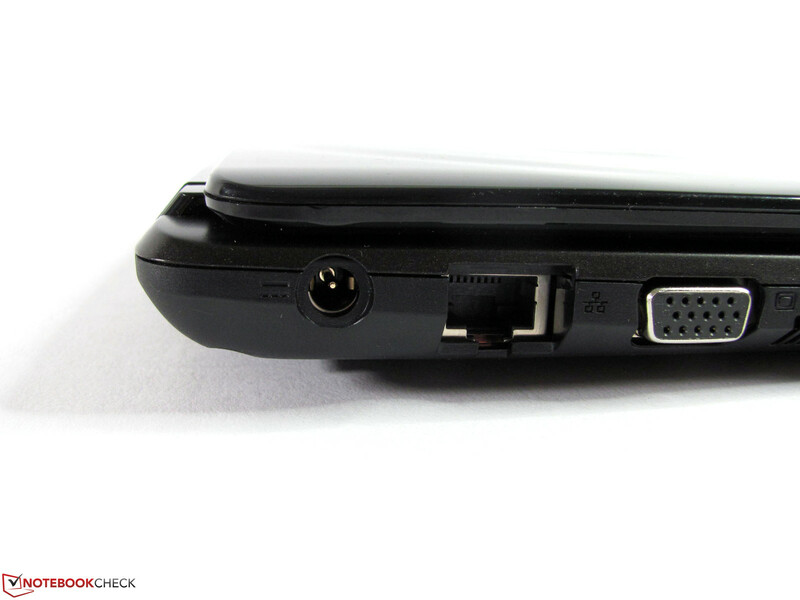 The port spacing on the left side is larger but the ports themselves are located more toward the front and may cause cables to become entangled. The Aspire One 722-C62kk has a basic level of equipment and supports the IEEE 802.11b/g/n protocols, Bluetooth 3.0+HS, and a 0.3 MP webcam. Interestingly, only the Fast Ethernet 10/100 Mbit/s standard is supported and network connectivity will be more limited when compared to other modern notebooks. 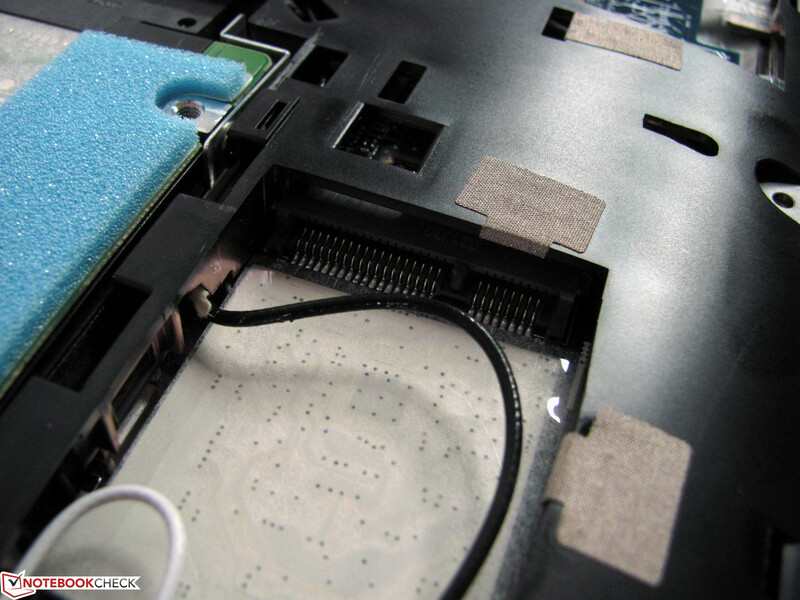 A large cover on the underside conceals all the important components. Revealing this cover reveals a second, empty memory slot and a second mini-PCI Express slot next to the built-in Wi-Fi card that allows the user to add a full-sized mini-PCI Express card. While it is physically possible to add a Universal Mobile Telecommunications System (UMTS) module, doing so will require additional modification as the necessary antennae are not installed. The addition of a second memory module would allow the system to reach its maximum of 4 GB but will not increase the memory bandwidth due to the AMD C-60 having only a single-channel memory controller. 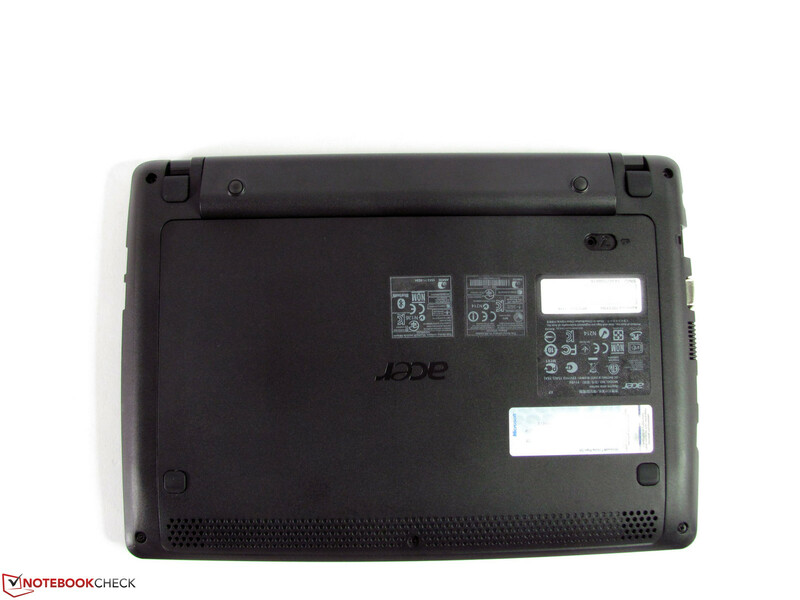 The Aspire One 722 is covered by Acer’s standard one-year carry-in warranty for its netbooks. European law also mandates that all manufacturers provide a two-year warranty on top of the standard. 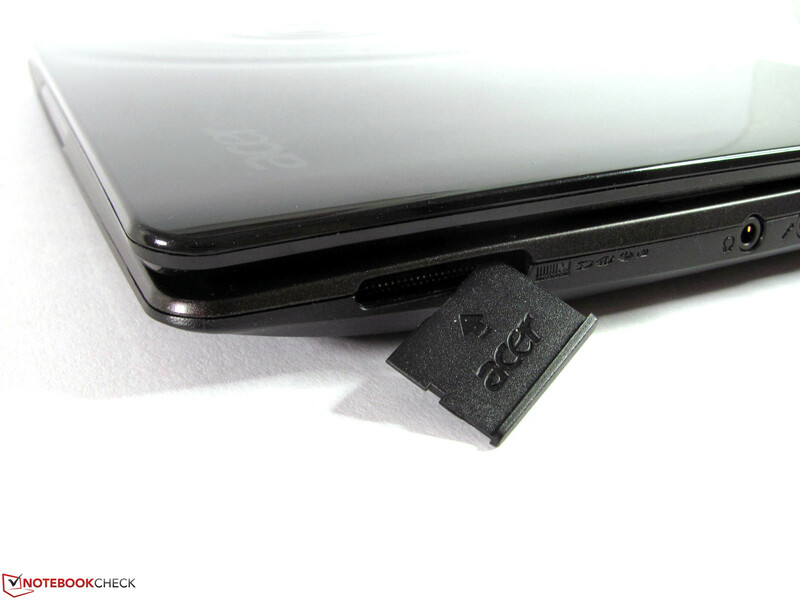 The warranty can be extended to three years via the Acer online store to include a combination of carry-in service and accident and travel insurance for about 90 Euro ($110 USD). 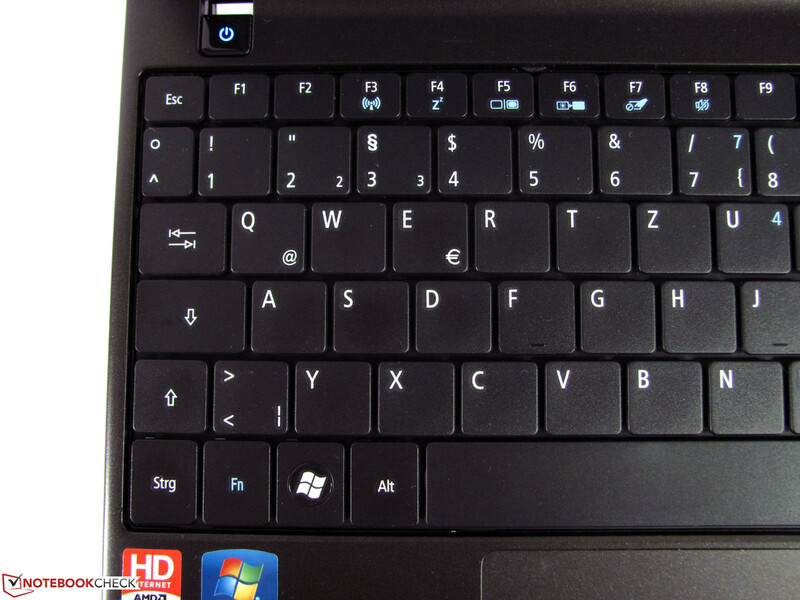 The keyboard uses normal-sized 19 mm (0.75 in) keys in a high-contrast layout. 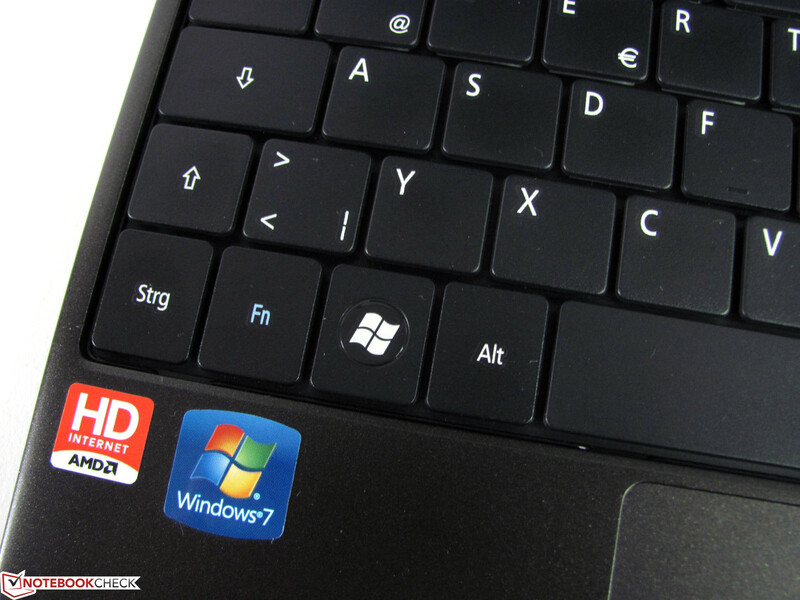 All important functions are available via Fn-key combinations. The keys themselves have a short key drop and a soft, indefinite pressure point. 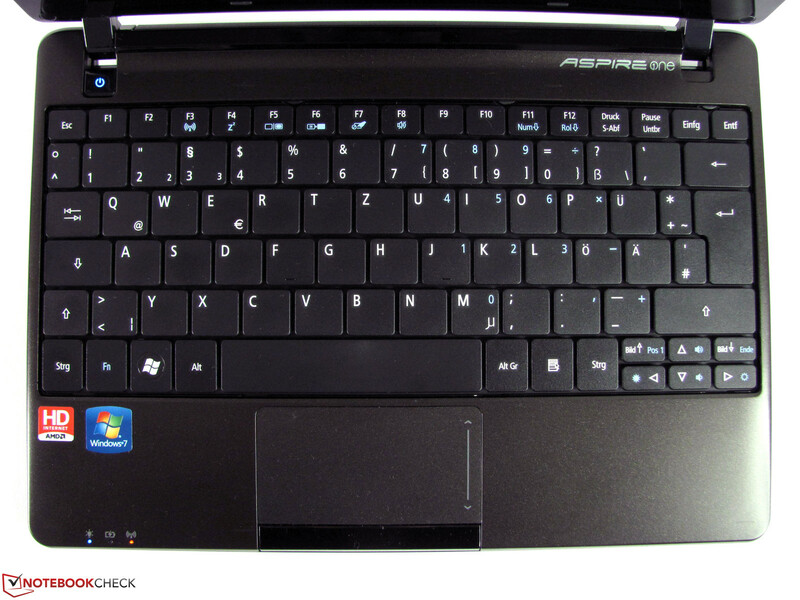 As such, the keyboard tends to bounce and bend more or less across the entire keyboard surface. The keys make an unobtrusive mechanical typing sound but the larger keys, such as the space bar and return key, rattle a little. 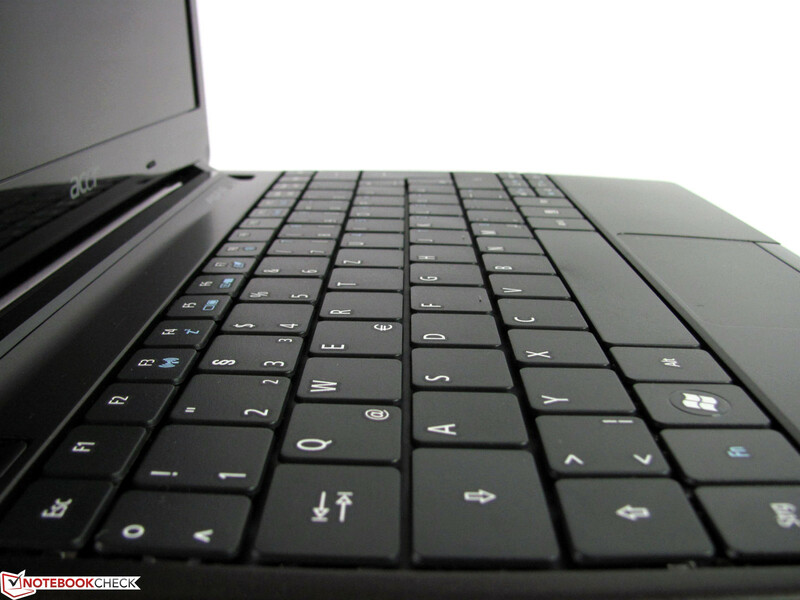 The touchpad uses a large, structured surface that allows for smooth gliding. 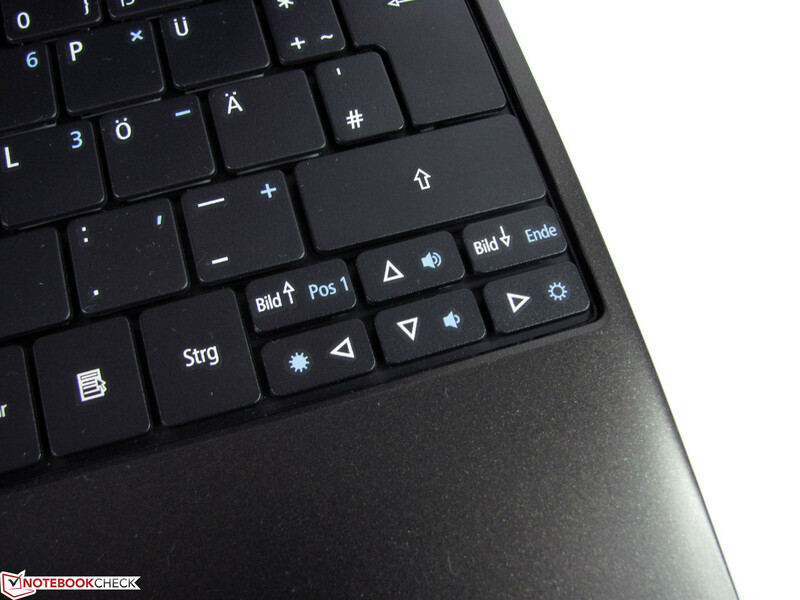 Usual multi-finger gestures are supported and the touchpad can be turned on and off using an Fn-key combination. 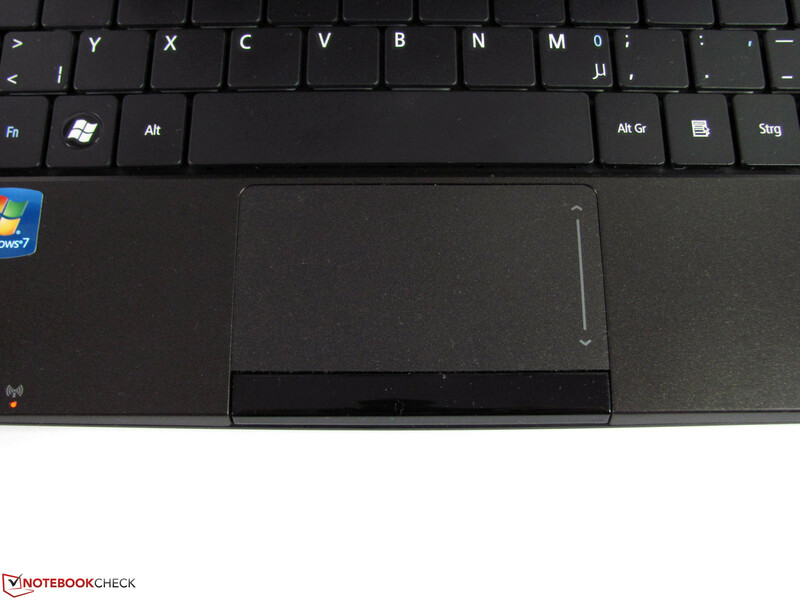 We found the one-button design of the touchpad to be unpleasant. The button itself is thin and the button drop is too small. There is room for improvement in terms of ease of use. The middle of the button has a worse reaction than the already-long reaction times and makes it difficult to use both left and right buttons simultaneously. 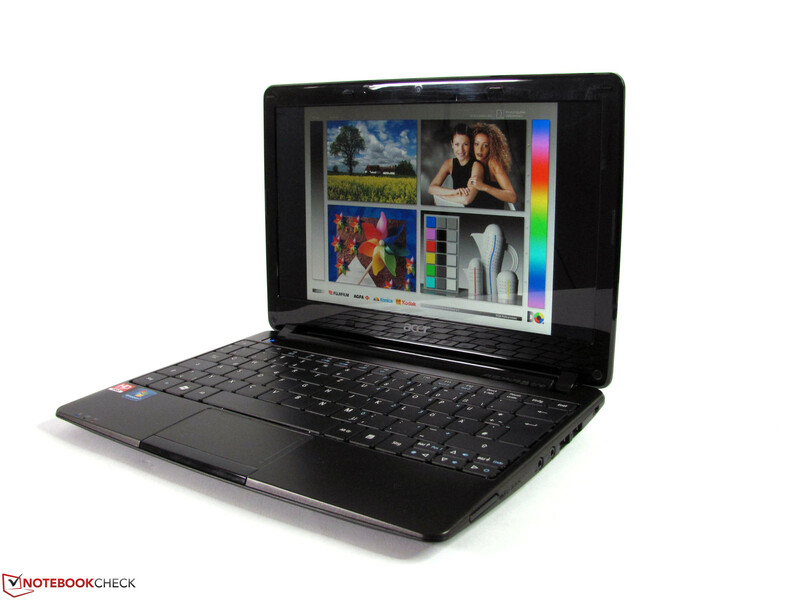 The Aspire One 722 has a glossy LED-backlit 1366x768 (WXGA) screen. This gives the display the same desktop resolution as standard 15-inch notebooks. 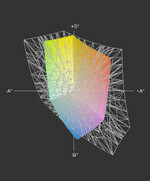 The resulting higher pixel density of 135 dpi causes images and text to appear much smaller. We observed a maximum brightness of 245 cd/m2 and a very even brightness distribution. 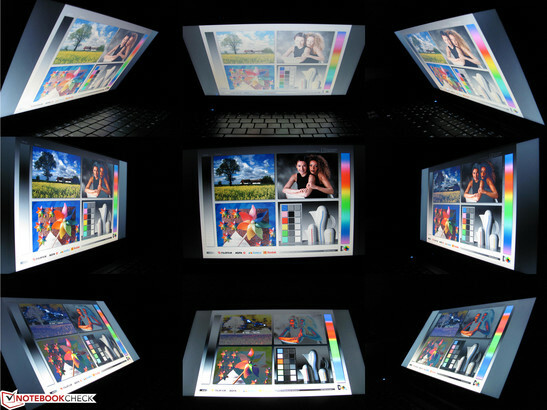 The display’s brightness can be adjusted in 9 distinct brightness levels with step 5 yielding the standard 150 cd/m2 level for indoor use on matte screens. 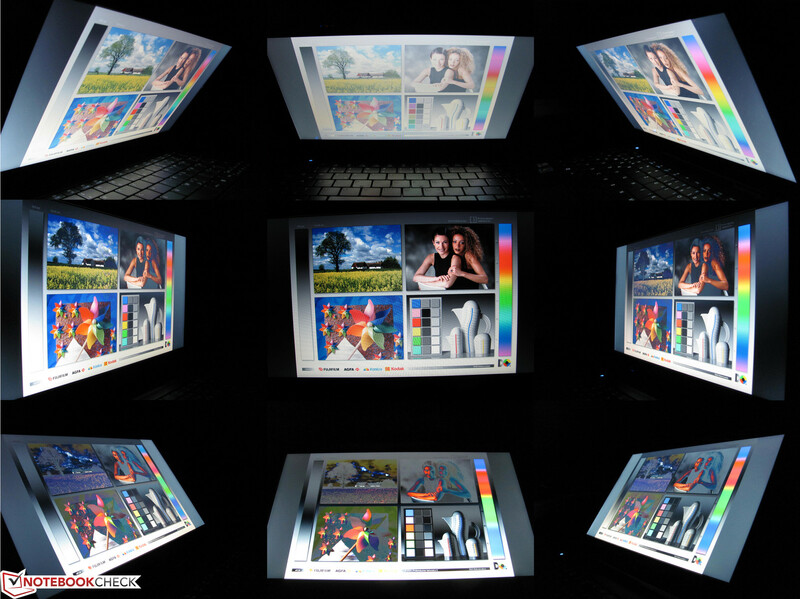 Most users will likely select a higher level of brightness to reduce mirroring from the glossy screen. We measured a black level of 1.4 cd/m2 and a corresponding contrast ratio of 186:1. This low contrast is noticeable in the display’s weak colors. Black tones appear dark grey and whites appear light grey. This effect is typically more visible on matte screens and our test sample’s glossy screen appeared subjectively better. The glossy screen also results in a somewhat sharper display as compared to a matte screen. The display of our test unit was able to reproduce only 59 percent of the sRGB color space and is comparable to other standard displays. 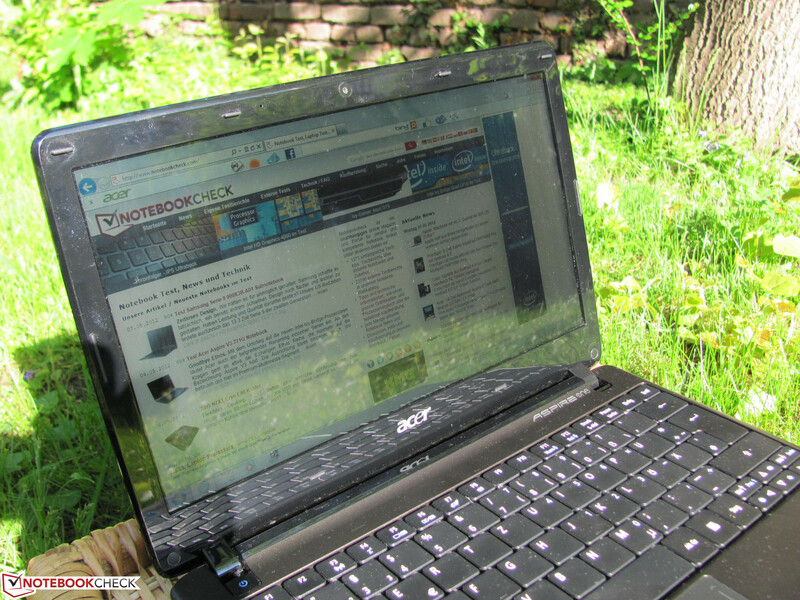 The Aspire One 722 makes a surprisingly good impression in outdoor use as the smaller screen makes it easier to avoid reflections. The fact that the decent brightness is available on battery power also helps. 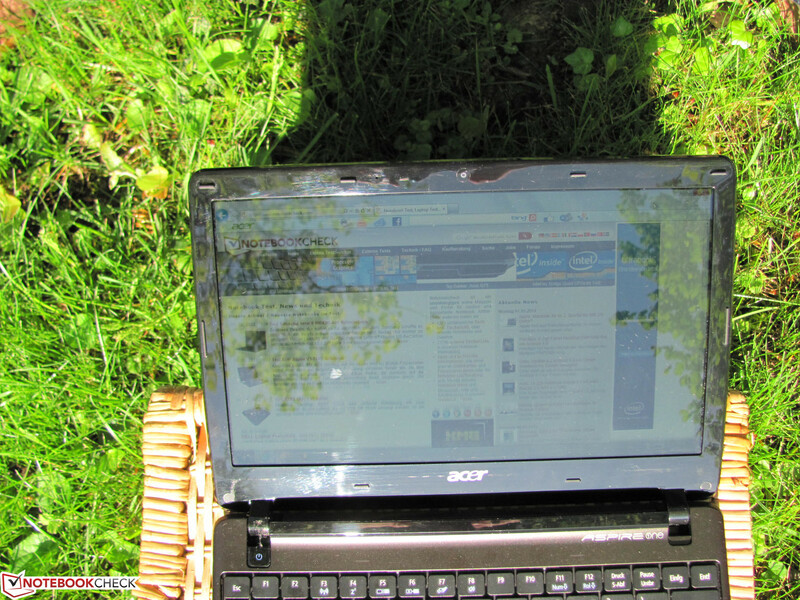 As a result, it is possible to view and work with screen content, assuming one can work in a good place and avoid direct sunlight. Viewing angle stability was consistent with that of a typical twisted nematic (TN) display and displayed images quickly fade when viewed from above and undergo color inversion when viewed from below. We observed an optimal viewing range of 15 degrees below head-on and 25 degrees above head-on. The horizontal viewing range is much larger and the contents are recognizable, albeit with color and brightness variations. 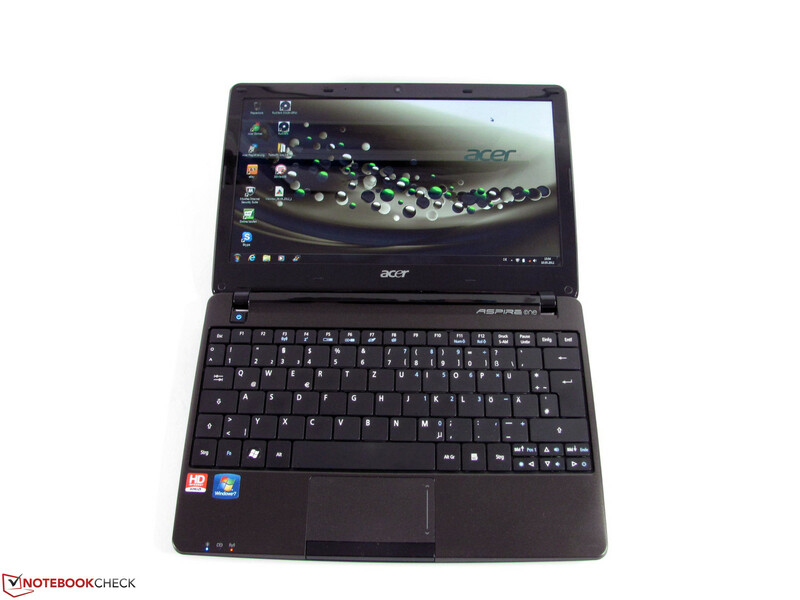 For the Aspire One 722-C62kk, Acer replaced the dual-core AMD C-50 CPU with a more powerful AMD C-60 dual-core CPU which can dynamically overclock its base 1 GHz clock to 1.3 GHz. 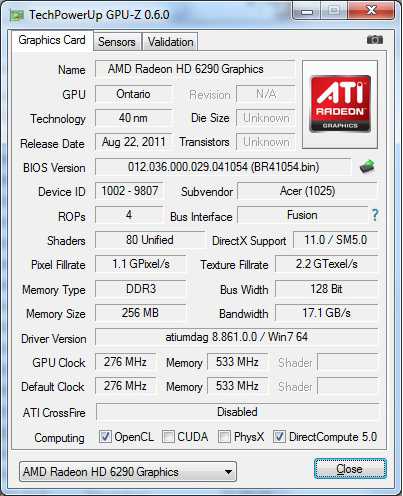 Another advance is the AMD Radeon HD 6290 graphics card which can also dynamic overclock to 400 MHz and promises improved performance. The single-channel memory controller, shared graphics memory, and thermal design power (TDP) remain unchanged. The system includes one 2 GB memory module which should be sufficient for more applications. Those who work with large picture files or other memory-intensive programs may choose to expand the system to its maximum memory size of 4 GB by either replacing the included 2 GB module or adding an additional 2 GB module. 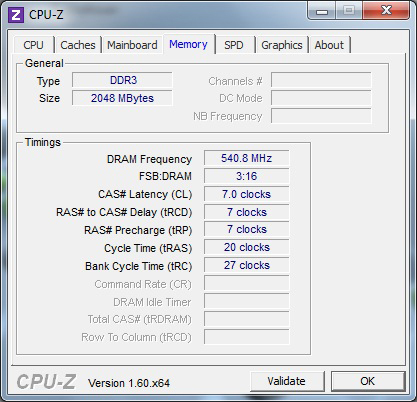 The AMD C-60 CPU has a variable clock rate that ranges from 800 MHz in energy-saving mode to a standard 1000 MHz to a Turbo Core speed of 1300 MHz. 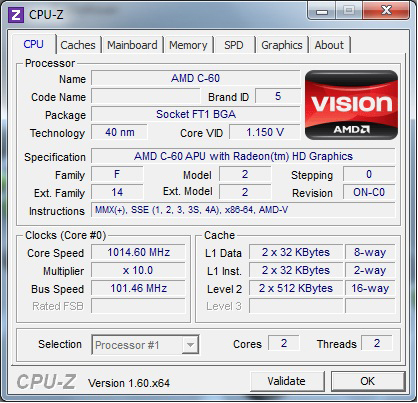 The additional clock speed when compared to the AMD C-50 is reflected in the better CPU benchmark scores. We observed between 100 and 300 points more in the various Cinebench CPU benchmarks reflecting a 10 to 20 percent increase and the wPrime 1024m benchmark required 25% less time at 2767 seconds. Performance-intensive applications make use of AMD’s Turbo Core technology which provides a noticeable increase in performance. This was evident in iTunes’s MP3-to-AAC conversion where we observed a conversion speed of 8.7x, a 90 percent increase over the AMD C-50’s 4.5x conversion speed. Only one additional RAM module slot. 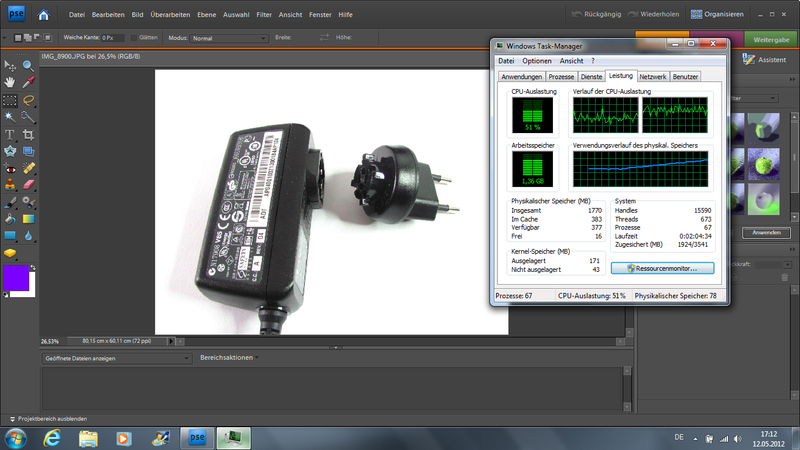 Photoshop is usually not CPU-intensive. 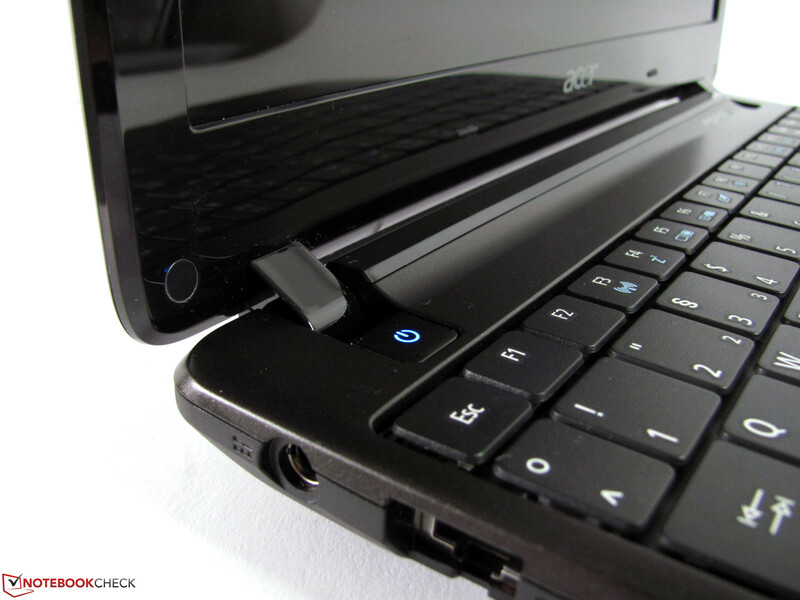 A dual DVT stick is no problem for the Acer Aspire 722. Neither is the playback of Full HD video. 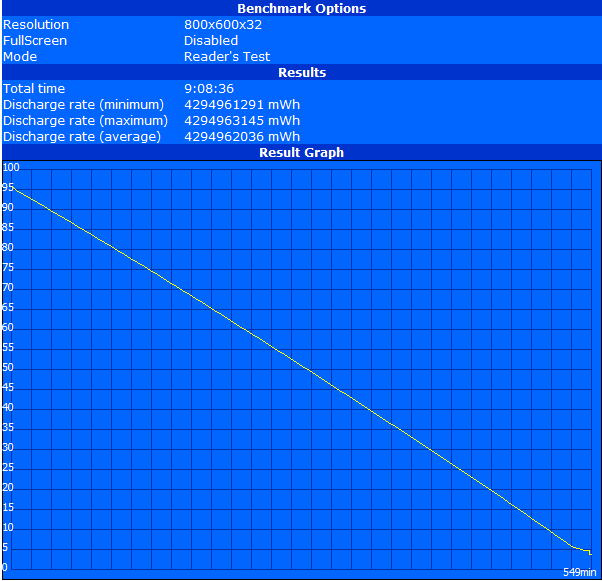 On the other hand, the PCMark benchmark tests did not show as much of a performance gain. The Aspire One 722-C62kk achieved 1782 points in PCMark Vantage and 785 points in PCMark 7 as compared to the 1582 points and 747 points respectively of the AMD C-50. 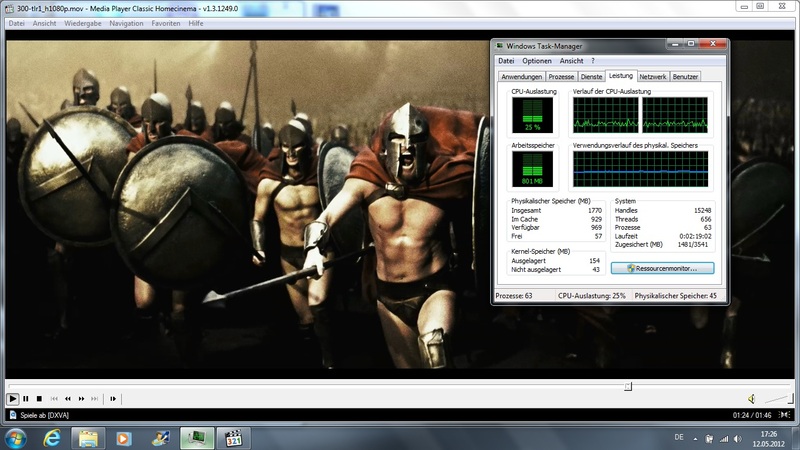 These scores show a 5 to 12 percent performance increase, clearly below the results of the pure CPU benchmarks. 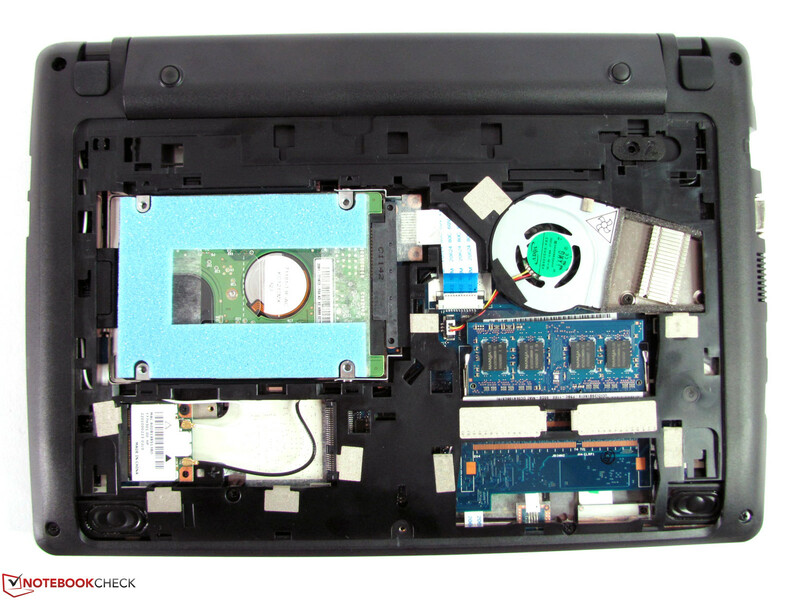 While the results of our system performance tests clearly place the Aspire One 722-C62kk at the lower end of the performance spectrum, we found that one can subjectively work fluidly. Program starts may take more time than usual but longer waits and system hang-ups are very rare. 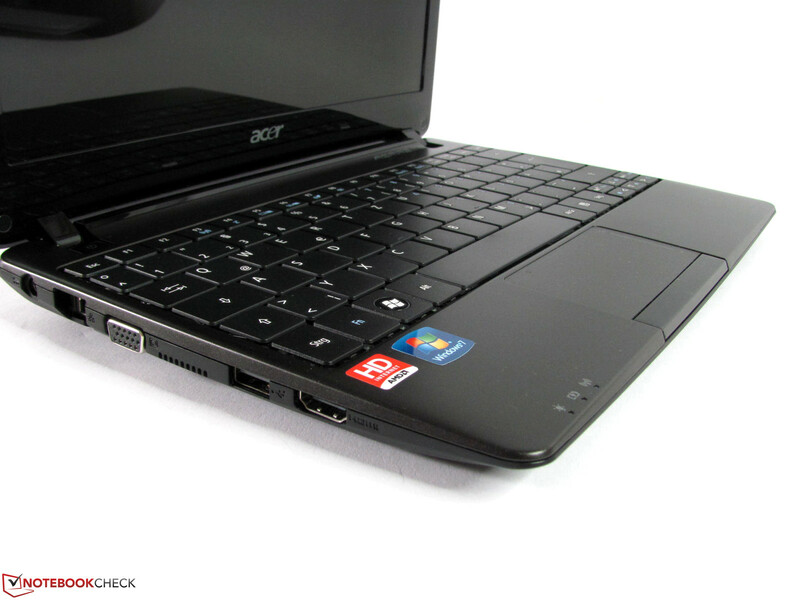 All in all, the Acer Aspire One 722-C62kk is on the same level as Intel-based netbook competitors. 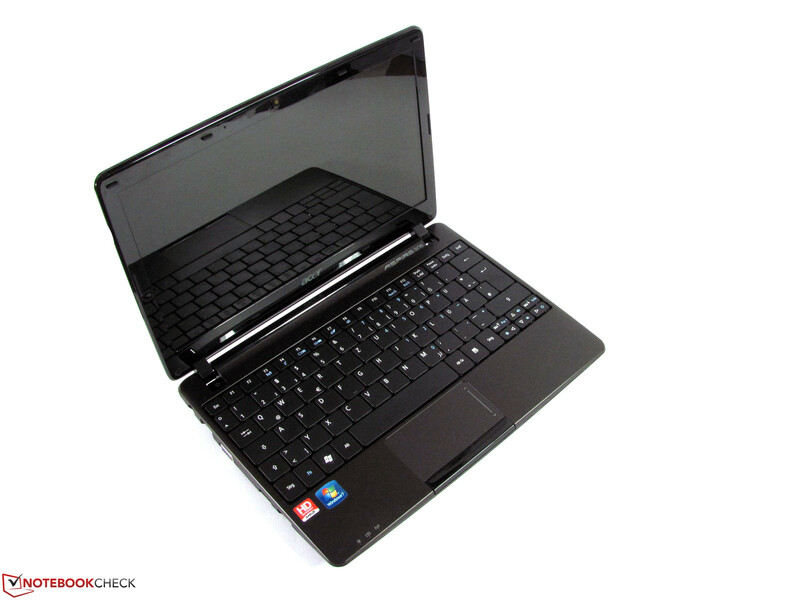 The Acer Aspire E-series features AMD Fusion APUs and offers more performance. In order to judge hardware performance when editing photographs, we tested the Aspire One 722-C62kk with various Photoshop Elements tasks. The system was easily capable of opening 30 picture files ranging in size from 1 to 2 MB (shown in the model pictures) and handled our typical tests. Larger 10 MB image files caused some system slowing and the tasks took longer. As the opening of the files only placed a 50 to 60 percent load on the CPU, the limiting factors are the hard disk transfer speed and memory size. It would be possible to speed things up using more memory or a faster hard drive. We were able to properly execute the liquefy, charcoal, and twirl filters but required more processing time than usual. Larger image sizes obviously required longer processing and wait times. The largest barrier to ambitious users is the glossy screen as its small color space, low resolution, and small viewing angle will satisfy only the casual photographer. 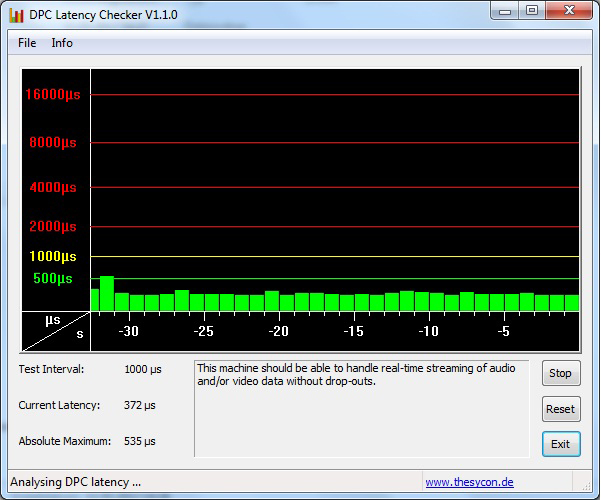 We also tested the performance of the MSI Digi Vox Diversity DVB-T stick. With its two tuners, the DVB-T is capable of either dual-tuning for better reception or viewing one program while recording another. Using the Arcsoft TotalMedia software, the C-60 CPU was more than capable of viewing TV programs and simultaneous viewing and recording. 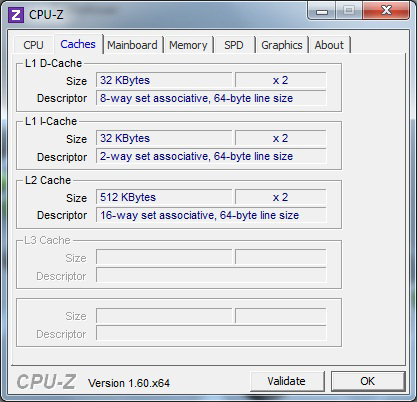 We measured CPU loads of 32 percent and 45 percent respectively for these tasks. Full HD movie playback was possible without any dropped frames. Using Media Player Classic, we observed a 20 to 30 percent CPU load while playing Big Top Bunny and 300 in H.264 format. Playing Windows Media Video (WMV) files in Windows Media Player was also possible without stuttering. We observed CPU loads of 9 to 15 percent while playing back Elephants Dream and Coral Reef Adventure. 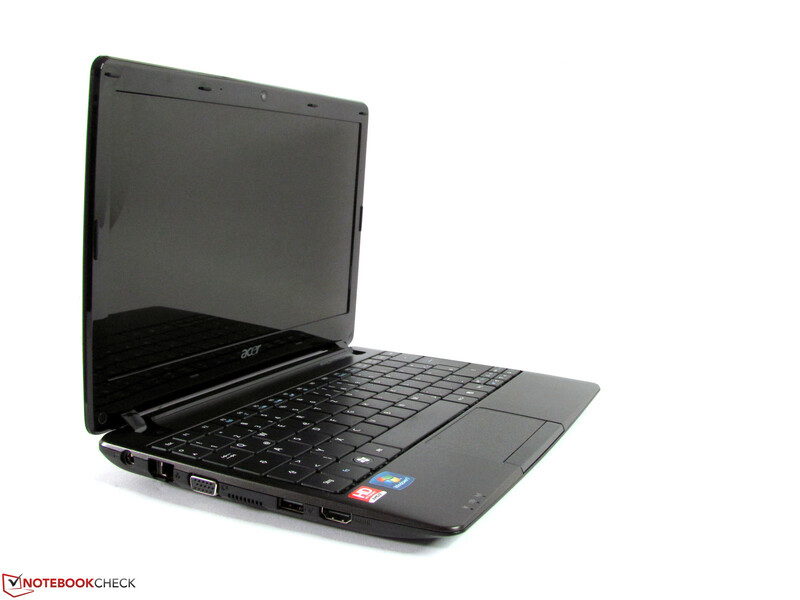 The Aspire One 722-C62kk features a conventional Western Digital 5400 RPM 320 GB hard drive. For a netbook, this is a lot of space for storing movies, pictures, and other data. 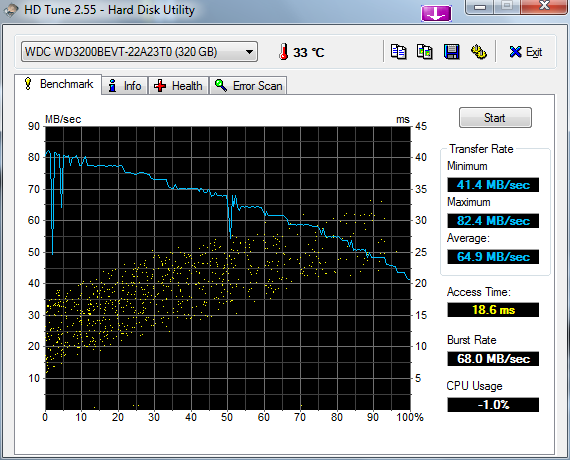 We observed a data transfer rate of 65 MB/s, making this drive one of the slower mid-range drives we have tested. An entry level solid state drive (SSD) could offer more speed but may also be bottlenecked by the CPU itself. 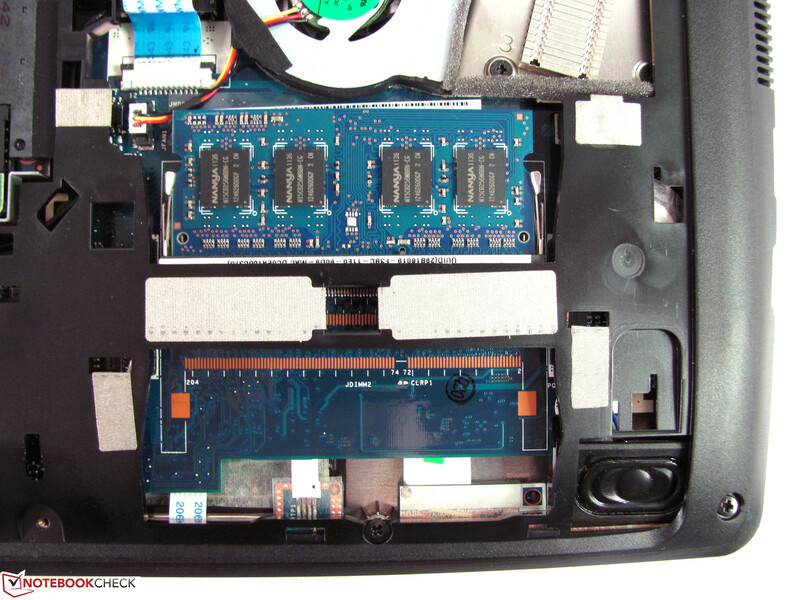 An mPCI-Express, but not mSATA, SSD module could be added as an option in the free slot mentioned in the Maintenance section. The graphics performance of the Acer One 722-C62kk benefits from the dynamic clock speed of the AMD Radeon HD 6290 and performed better in all graphical benchmarks than the Radeon HD 6250 used in the Aspire One 722-C52kk. The C62kk achieved 466 points in 3DMark Vantage and 200 points in 3DMark 11 as compared to the Radeon HD 6250 which achieved 423 and 186 points respectively. 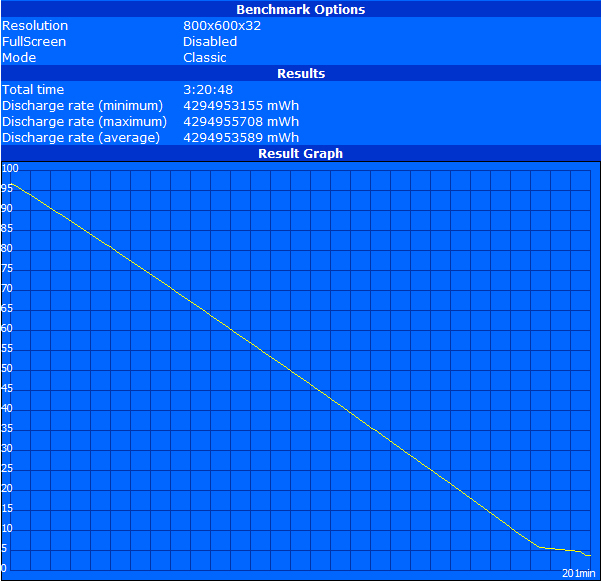 We also noticed that the 3DMark 11 score was higher at 212 points when in energy-saving mode. One possible explanation is that the reduced CPU power consumption at 800 MHz might allow the GPU to operate at maximum speed for longer periods of time until the maximum total power consumption limit is reached. 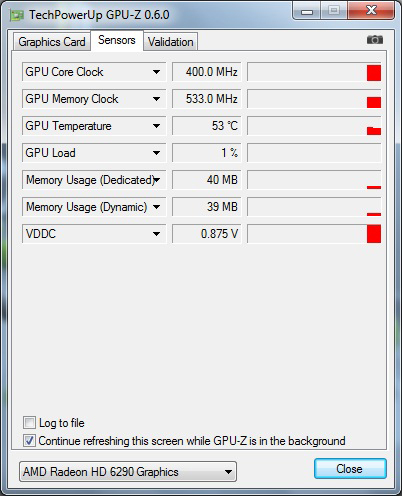 This GPU is sufficient for all normal office tasks, Internet, video playback, image processing, and TV. We were able to play the relatively undemanding World of Warcraft at 39 fps in low details at the native resolution and 47 fps and 23 fps in low and medium settings at a lower resolution. 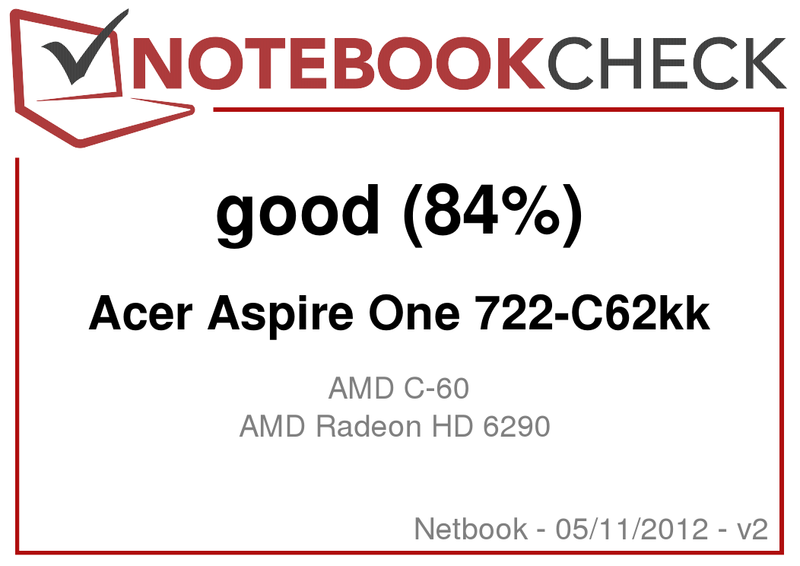 As a result, we conclude that the Aspire One 722-C62kk is insufficient for playing recent 3D games or for software with an emphasis on 3D graphics. The built-in fan ran continuously but remained quiet. It only turned off after longer periods of inactivity, allowing for completely silent operation. As soon as we interacted with the notebook, the fan reactivated. The system stayed pleasantly quiet at 30.2 dB(A) to 32.0 dB(A) under low load. Under heavy load, the fan became louder but nonetheless unobtrusive at 32 dB(A) to 35 dB(A). The aforementioned limited fan activity caused the base unit to heat up to a maximum temperature of 46.8oC (116.2oF) under maximum performance. 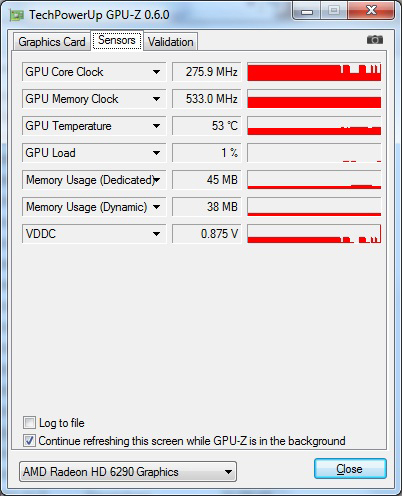 While this is not a critical temperature, we found it surprising given the amount of low-power components used. Perhaps Acer should have foreseen this development and included larger vents as the only heat exhaust is a small opening on the left where waste heat can be vented. The maximum temperature was about 12oC (22oF) lower during low loads and we found this temperature to be acceptable. (+) The maximum temperature on the upper side is 39.6 °C / 103 F, compared to the average of 33 °C / 91 F, ranging from 21.6 to 53.2 °C for the class Netbook. 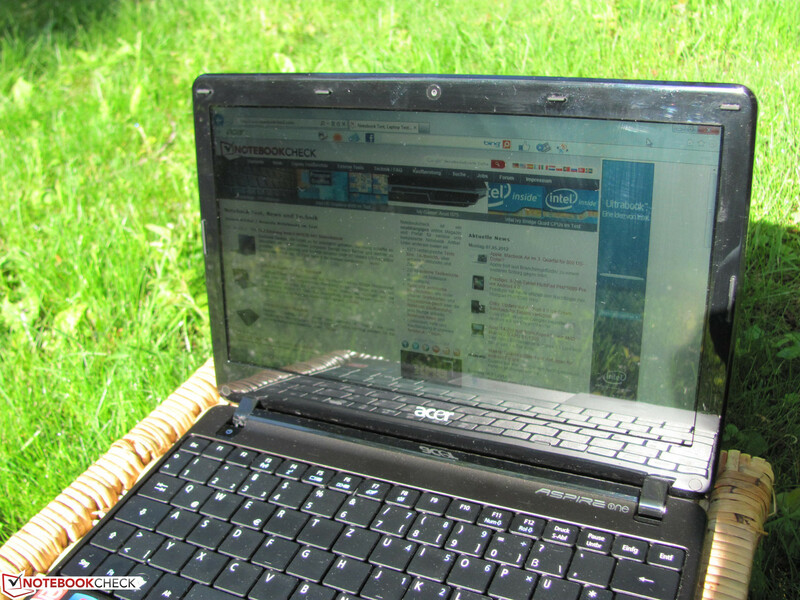 (-) The average temperature of the palmrest area of similar devices was 29.3 °C / 84.7 F (-6.9 °C / -12.5 F). The built-in speakers are sufficient for system sounds, simple web-videos, and background music. We felt the speakers were more or less “trebly” with weak mid-tones and lacking bass. Headphones and cheap USB speakers easily provide a massive improvement. 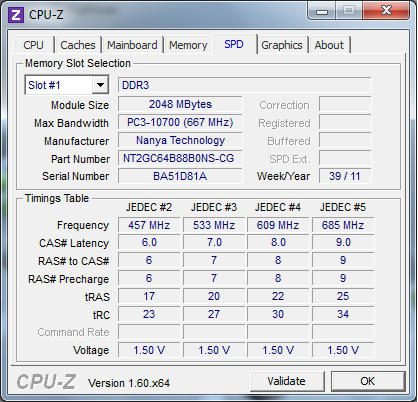 We measured a power consumption of 7.7 to 10.8 Watts during low CPU loads, reflecting a power consumption gain of 0.7 to 1.5 Watts over the Aspire One 722-C52kk that was previously tested. Under maximum load, the gap was smaller as we observed a power consumption of 17.8 Watts, an increase of 0.5 Watts. The Aspire One 722-C62kk includes a 6-cell built-in battery with a rated capacity of 48 Wh and a 270 gram (0.6 pound) weight. This capacity corresponds to what one might expect from most notebooks from the netbook class. 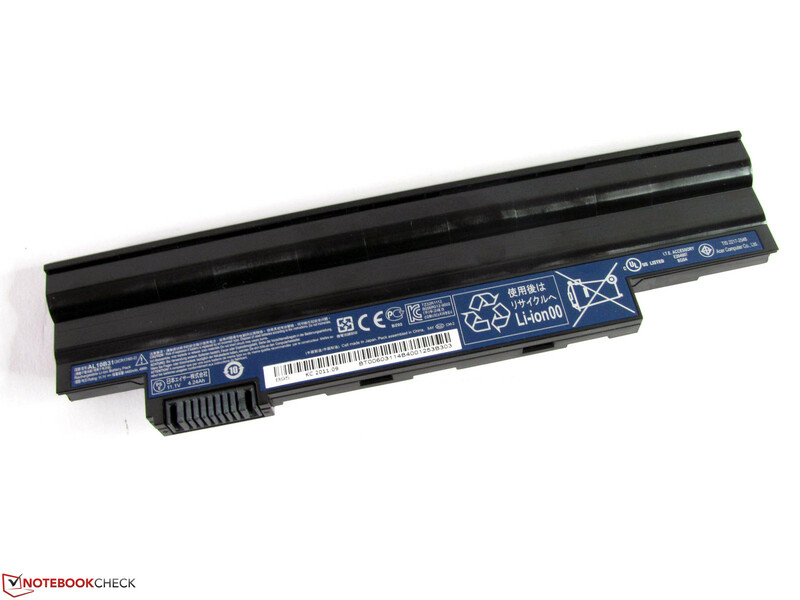 The 6-cell battery raises the back end of the notebook slightly and some may opt for the smaller and lighter 3-cell battery (model number BT.00303.022) that is available for about 80 Euro ($99 USD). The previously mentioned increase in power consumption resulted in an observed reduction in battery runtime. 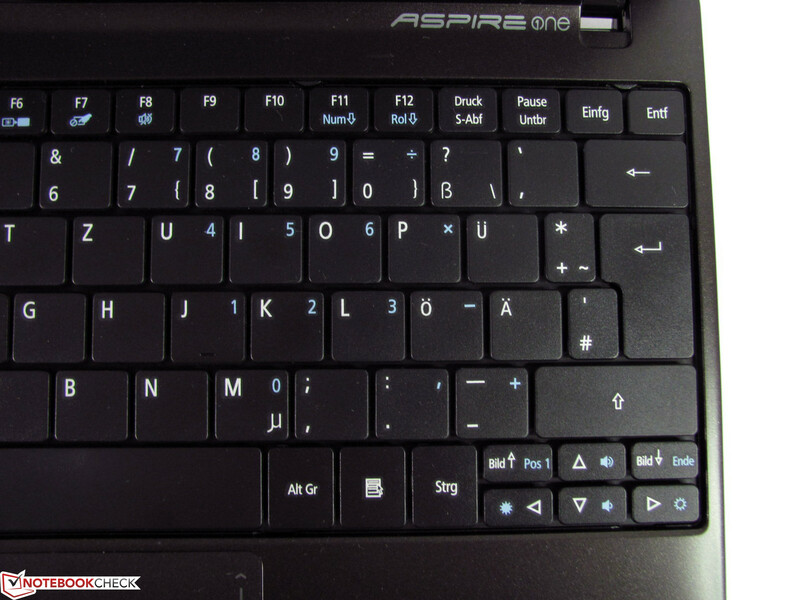 In the BatteryEater Reader Test, with minimum brightness and all wireless modules disabled, our Aspire One 722-C62kk achieved a runtime of 549 minutes, approximately 100 minutes less than the slower Aspire One 722-C52kk. 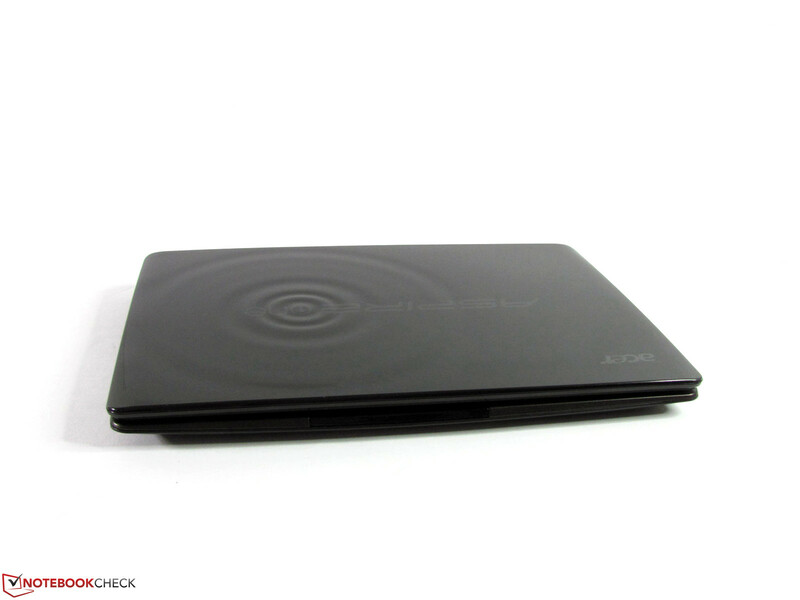 In other tests, our sample Aspire One 722-C62kk performed better. In the Wi-Fi surfing test, with an approximate brightness of 150 cd/m2 (level 5) and a balanced profile, the battery lasted 407 minutes. Movies played back from the hard disk, at brightness level 7 and wireless modules off, drained the battery in 342 minutes. To determine the minimum runtime, we used the BatteryEater Classic Test with a higher power profile, maximum brightness, and all wireless modules turned on. We recorded a runtime of 201 minutes in this scenario. It should be noted that the results of the Reader Test are merely a speculative, theoretical value and there should be no significant loss of battery runtime in practical use when compared with the slower 722-C52kk. 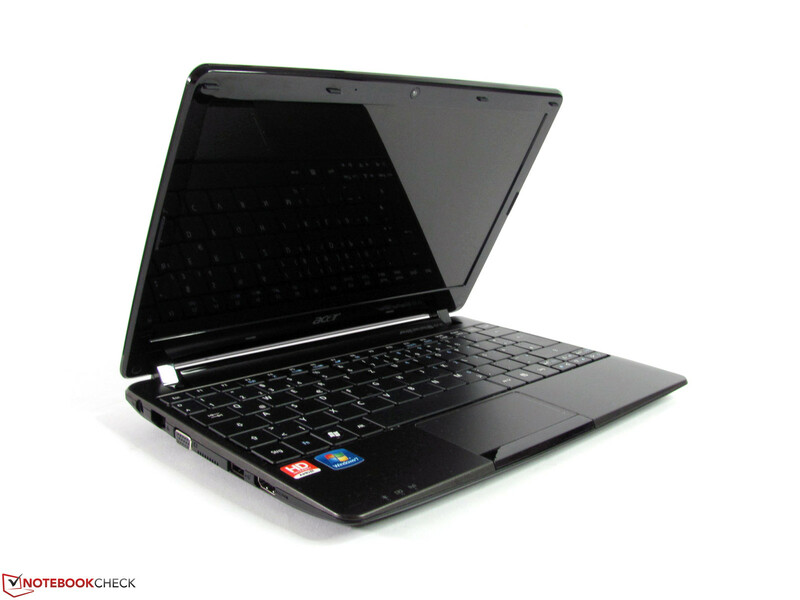 With the Aspire One 722-C62kk, Acer has upgraded the performance and improved the display qualities of its netbook. Computing power is sufficient for a wide spectrum of applications and should satisfy most home users. Otherwise, the notebook is more or less comparable to the previously tested unit. The low weight, mitigated case quality, and frugal but adequate connectivity options are unchanged and sufficient for the target audience. Unfortunately, some weaknesses such as the wobbly keyboard, glossy low contrast screen, and higher case temperatures are still apparent. These disadvantages may not impact each user in the same way but they might tip the balance for users seeking other options. On the other hand, one of the notebook’s strengths is its great battery life that has not diminished despite higher performance and even increased in some real world applications. 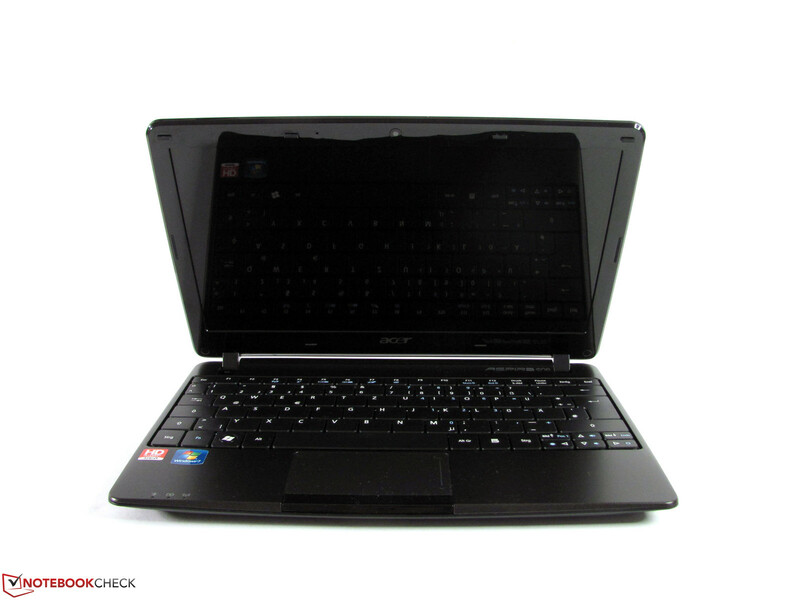 In summary, the Aspire One 722-C62kk is a good improvement over the C52kk and, in some aspects, is a good alternative to current netbook options. 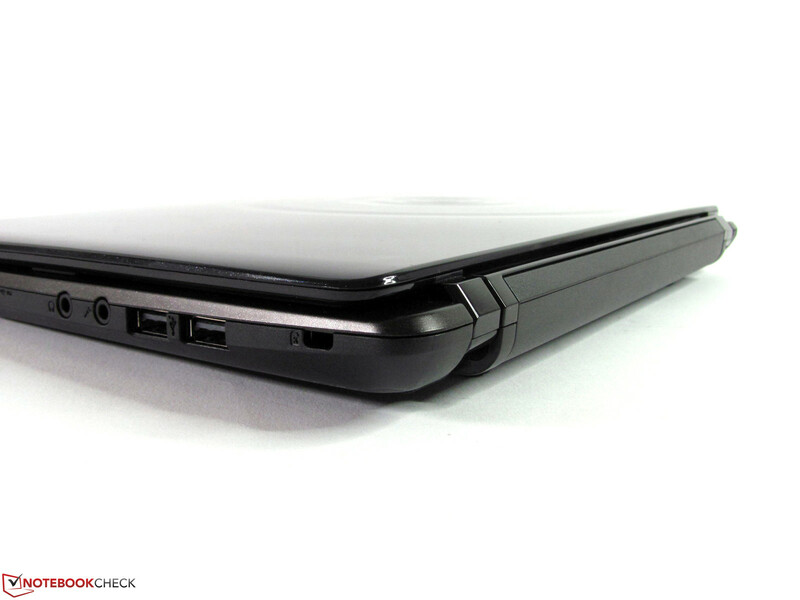 The Aspire One 722 is an 11.6-inch netbook. Viewing angle and contrast could still be improved. The keyboard and left wrist rest are not solidly supported. The webcam only has a 0.3 MP resolution. The small air vent has a hard time keeping up with the exhaust heat. 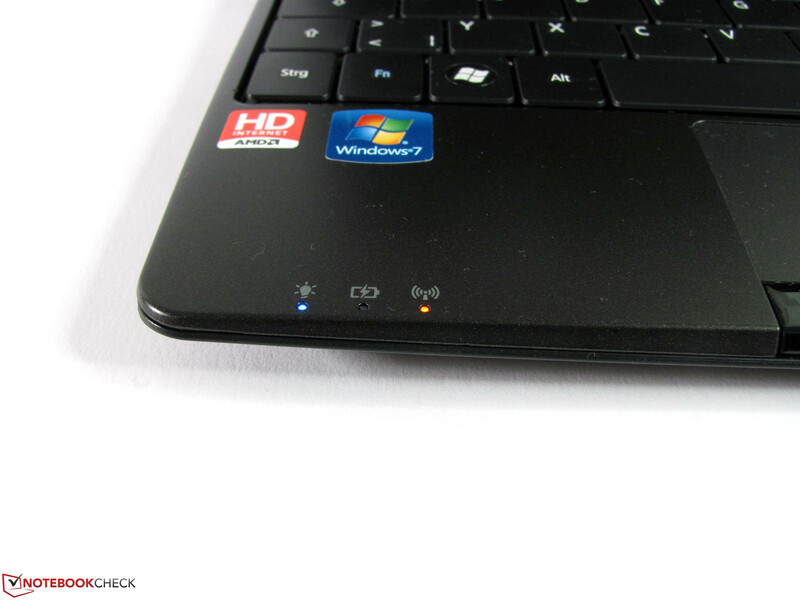 The power button is well positioned and discretely illuminated. 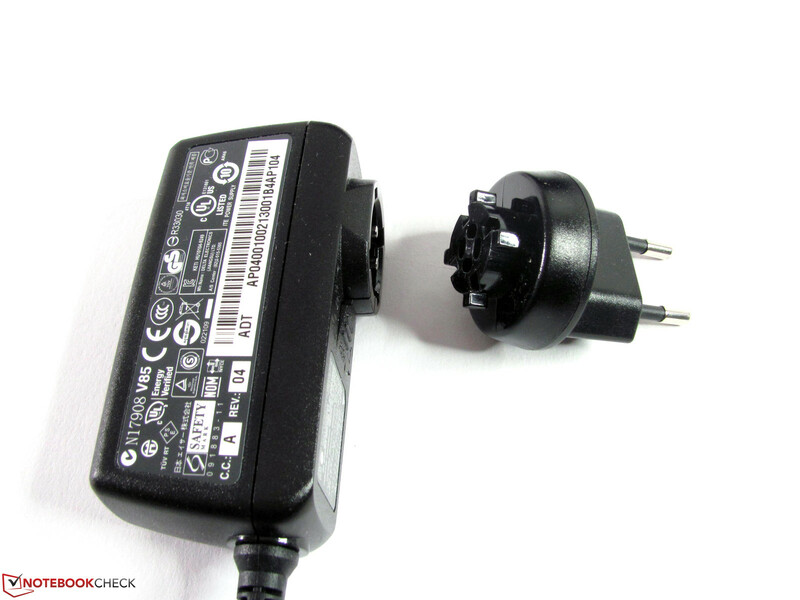 The small power supply can be adapted to different plugs. Status LEDs on the front edge. A large maintenance cover conceals the main components. 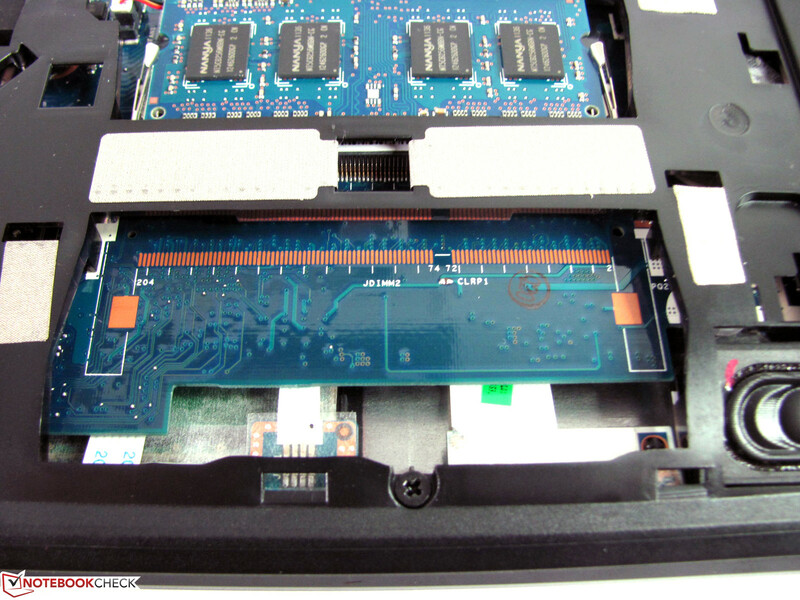 A free mini PCI-Express slot allows for upgrading. Only one RAM module can be added. 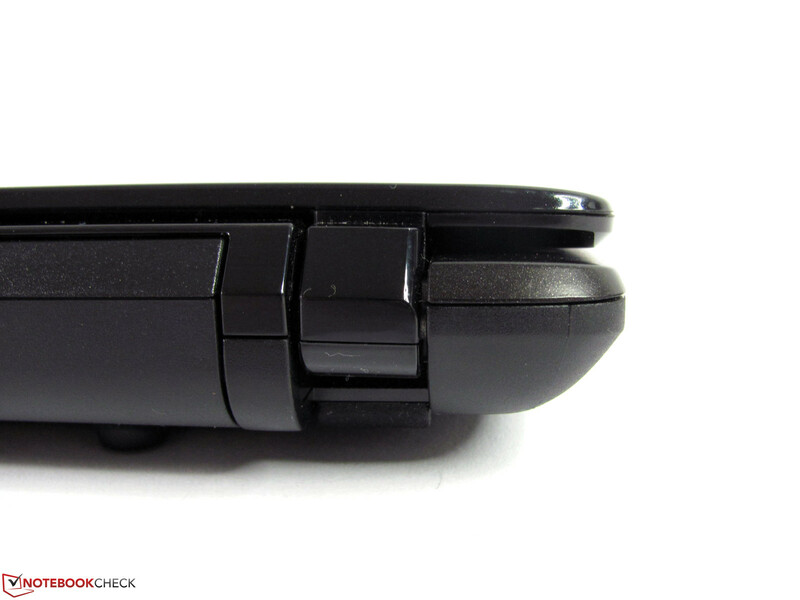 Additional rubber feet allows for stability without a battery. 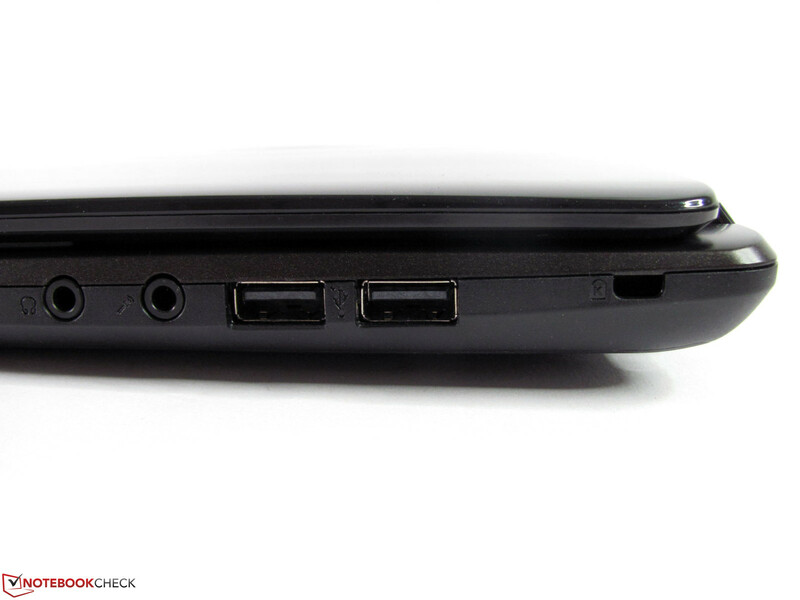 Two discrete audio ports allow the use of audio components with 2 jacks. and offers higher resolution and brightness. The large opening angle allows for versatile use. The One 722 only supports Fast Ethernet (100 MBit/s) instead of Gigabit LAN. 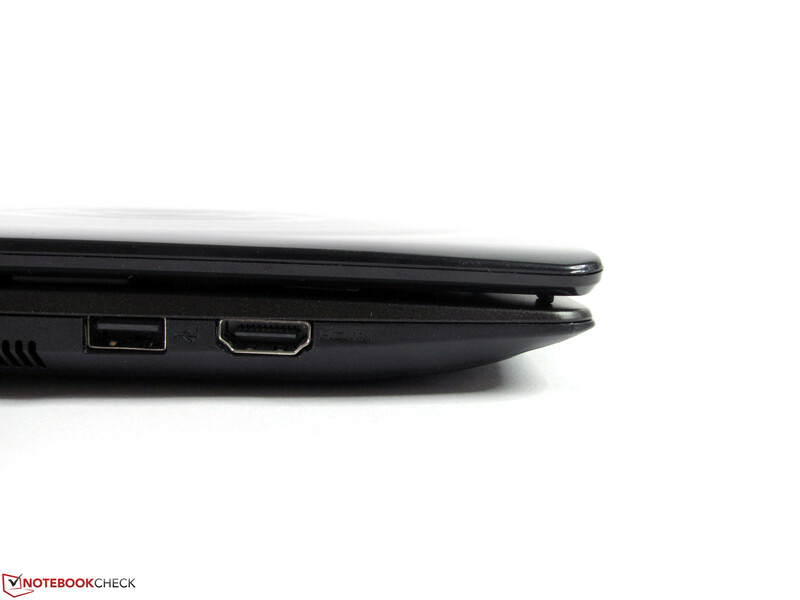 HDMI and USB ports are on the front, left side. The hinge holds the display firmly. Good battery life allows longer mobile use. Low-consumption components which allow long battery runtimes. A better display and better heat management. Acer left the weak keyboard and wobbly wrist rest unchanged. 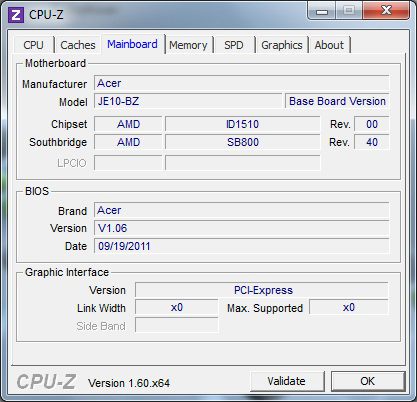 The Aspire E-series featuring AMD Fusion CPUs are the primary competition. 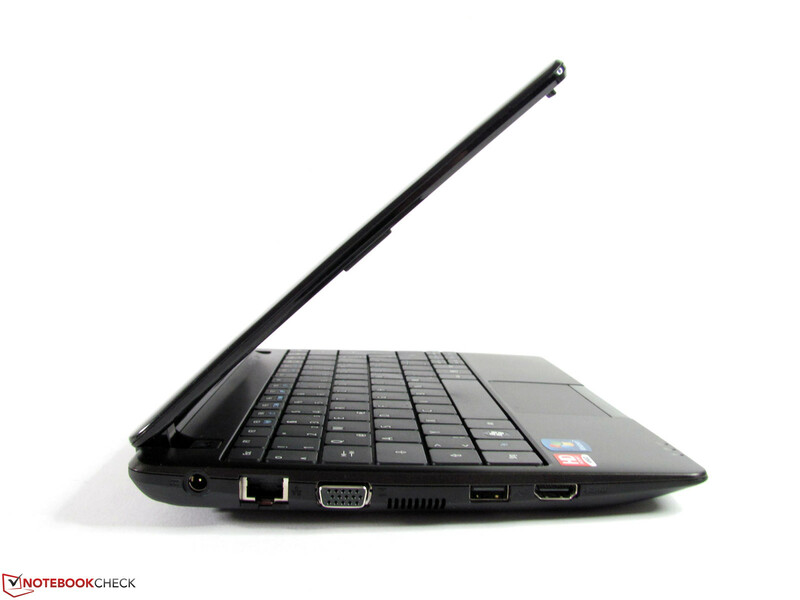 Intel -based netbooks are weaker in most categories and can only do better in price or in individual components.